This species is found in the Mississippian Region, Gulf Coastal Region, formerly not extending beyond the Guadalupe River system, Texas, but recently found in the Rio Grande System; where it is possibly introduced. It is considered stable throughout most of its range. Its range includes Mississippian Region (as far north as the southern tip of Illinois, southeastern Missouri, and western Kentucky, and west into southeastern Kansas, eastern Arkansas, and western Texas), Gulf Coastal Region (southern Georgia to eastern Texas), formerly not extending beyond the Guadalupe River system, Texas, but recently found in the Rio Grande System; possibly introduced. In the Coosa River basin in Georgia, it is known historically from the Coosa, Etowah, Oostanaula, and Conasauga River drainages but is very rare in the state today. Comments: The bleufer is best known for its brilliant purple nacre which gives it the scientific name purpuratus. It is sometimes called “purple shell.” Externally, the bleufer has a very dark periostracum and a slight wing arising on its dorsal side. 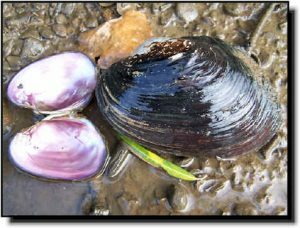 It is one of the larger mussels in Kansas. The female is more inflated and truncated toward the posterior end. Because of its colored nacre and large size, it has been used in the past for jewelry inlays. It is most confused with the pink heelsplitter. In similar sized shells, the bleufer has a more inflated, heavier shell and the ventral margin is nearly straight. The bleufer appears to be a habitat generalist and can be found in pools, riffles and runs of rivers and is often present in reservoirs and below low-head dams. 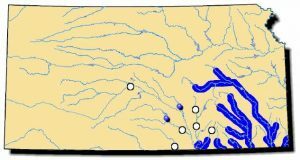 This is a southern Mississippi River Basin species and is at the northwest periphery of its range in southeast Kansas.